Pigs may not fly, but dogs CAN drive cars. As impossible as it sounds, dogs have been trained to drive cars. You heard right: dogs can steer, shift gears, and use the gas and brakes to drive cars. They may not have gotten the hang of using turn signals yet, but there are plenty of humans who haven’t either. 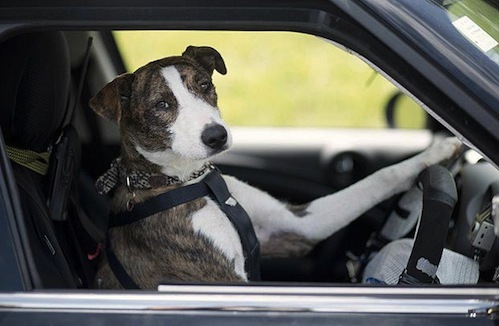 Now, dogs driving cars is interesting, but how does it affect your life? Well, if I could train my dog to pick up some groceries or drop off my kids at school, it’d sure save time. But more important, it shows that sometimes, impossible things aren’t so impossible after all. Maybe all it takes is a vision of what’s possible and the structure to turn that vision into reality. Plus a lot of dog treats. So, how do you teach a dog to drive a car? First, let’s step back, and see exactly how these dogs learned how to drive a car, since that helps us work backwards from the dog-driving-a-car goal to the starting point to see what made the transformation possible. Interestingly, the 3 dogs who were trained weren’t a special breed of super dog, trained for years. Nope. These were 3 average dogs from an animal shelter, who were trained over 2 months. Just 2 months. I know people who’ve had their driver’s license for 20 years who still can’t drive. Trainers equipped the cars with special handles on the steering wheel, and dashboard-level brake and gas pedals for the dogs. Then, the trainers gave the dogs plenty of positive reinforcement–and probably lots of kibble–to shape the dogs’ behavior toward the end goal. Trainers broke down the task–driving a car–into lots of small pieces so they could shape the dogs’ existing behaviors–sitting, pawing, etc.–into actions that would allow them to drive a car. The huge goal was broken down into a series of small, do-able steps. And in just 2 months, the impossible became reality. Now, dogs don’t know–or care–whether it’s dangerous for them to drive. They just care about the reinforcement. (Well, the males probably care about driving around in a cool ride to get more chicks, but that’s beside the point). Especially for new things–things that make us anxious–putting on the brakes is precisely the OPPOSITE of what we should do. Instead, we need to move TOWARD what’s making us anxious, taking small steps to confront our fear, and show ourselves that things aren’t really as risky as we think. Replacing your salary with self-employment income, plus having enough to sock some money away into savings. Freedom to volunteer in your kids’ school or go to a doctor appointment without feeling stressed about missing work. Financial security from being paid by multiple clients instead of a single, shaky job. Having consistent and growing income from self-employment. Having the same–or better–benefits that used to tie you to your stressful job. At the moment, that vision might seem impossible. But remember, that’s your “dog-driving-a-car”–the thing that only SEEMS impossible. Remember, if you follow the blueprint above, you can turn the impossible into reality. One way to engineer your environment is to carve out even just 30 minutes a day to work toward your goal. Next, you could enlist family and friends who can support and reinforce your efforts–or give yourself plenty of kibble as a reward. Finally, you could shape your existing behaviors toward your goal, maybe by identifying the skills, knowledge, and expertise you already have and that someone would be willing to pay for on a freelance or contract basis. Now you’re started down the path toward your “impossible” goal. With the right kind of mindset and structure, you can do the impossible. And once you see the world in a new way, there’s no turning back. Question your beliefs about what you can achieve. Find or create a structure to lead you to your vision. After all, if a dog can drive a car, what can you achieve? Greg Miliates started his consulting business in 2007, QUADRUPLED his former day-job salary, and teaches how to ditch your day job on his blog.